Other Distinguishing Features: Blue Chunks has blue skin. Blue Chunks was a super-freak that the future version of WildStar once defeated to save his younger self, much to the protest of Dragon. He later resurfaced within the Vicious Circle when they abducted Malcolm and Angel Dragon. 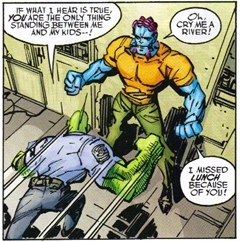 Blue Chunks was in charge of a group of Vicious Circle goons tasked with guarding the kidnapped kids at an abandoned Bellco Chemical factory. Dragon was tipped on his children’s whereabouts and engaged the Vicious Circle villains at the scene. During a melee with Dragon, Blue Chunks fell into a vat of chemicals. Blue Chunks died but was recreated as a new entity, the mass-murdering monster known as Virus.